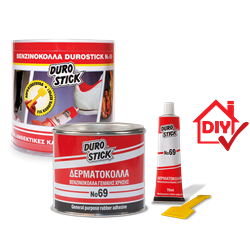 Powerful, two coat rubber adhesive with applications to shoe manufacturing, furniture manufacturing and construction. Also suitable for HVAC, industy and plastic boat applications etc. Bonds leather, pleather, foam plastic, rubber, cork, carpet, carton etc. to wood, metal and other surfaces or to each other. Achieves 75% of its strengths within the first hour after application and after 24 hours its final mechanical strengths. Necessary for repairs at home, the car or the boat and conveniently packaged in a 70ml tube and 125gr container. 70ml tube, containers of 125gr, 250gr, 500gr, 1kg, 5kg.